We don't often go out to eat. Our budget doesn't allow for it, and there are few local restaurants that we love. One of our favorites has this amazing penne alla vodka on the menu. You can order it plain or kicked up a notch with paprika. They call it "old school" -- and I always order it this way. We haven't been there in quite a while since Ada's bedtime usually coincides with when we dine out, and I've been missing the dish. We don't have the rich ingredients, like heavy cream and butter, that typically go into this boozy sauce. So, I improvised. Made it healthier and more week night friendly. 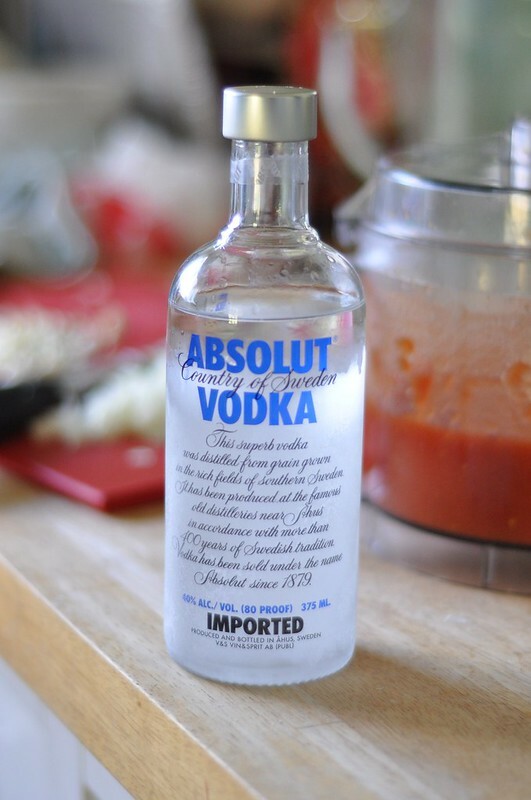 ***That's a lot of the hard stuff -- can vodka sauce get you drunk? No. 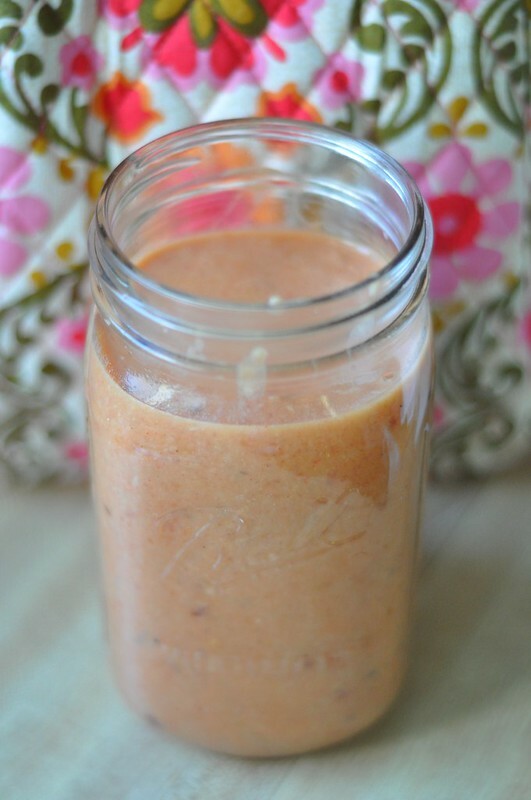 But as a breastfeeding mother, I investigated how much alcohol actually makes it into the sauce. Several sources cited that 60% of the alcohol burns off almost immediately with the heat of the burner. So, with the 6 or so cups of sauce this recipe makes, the amount that actually makes it into each serving is -- at most -- a mere teaspoon. In a large rimmed pan, heat 2 tablespoons of olive oil over medium-high heat. Add in the onions and garlic and cook for several minutes -- until onions are translucent, glassy. 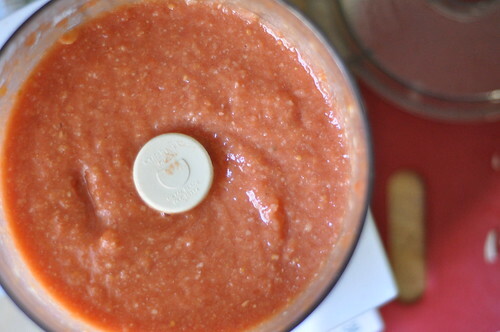 While that's cooking, puree the whole canned tomatoes in your food processor. Set aside. 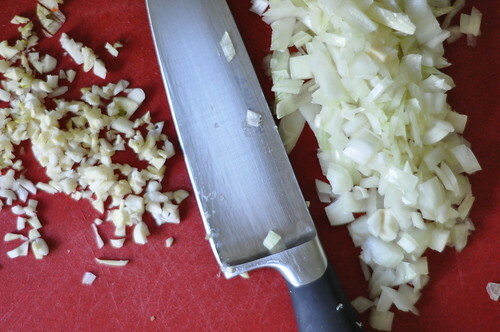 When the onions/garlic are ready, pour in the vodka. Cook for a couple minutes. Then pour tomatoes into the pan and cook for a few more minutes. Lower the heat and add in the spices and the almond milk. Make adjustments by tasting the sauce and tweaking to what you like. We went heavy on the paprika, obviously, but that smoky taste is incredible. Then after five or so minutes of the sauce simmering, scoop out two cups of it and put them into your food processor with the drained/rinsed beans. Process until smooth and then return back to the pan. Stir well. Season with salt and black pepper. Use some right away and store the rest for up to a week (or freeze). You might be wondering: "Why add the beans?" They were an afterthought if I'm being entirely honest. I mixed together what I thought would make a good sauce and it was soupy. Not nearly thick enough to cover pasta in any acceptable way. So, I used what we had in the pantry. White beans make the most sense. I quickly discovered that one can wasn't going to do the trick. Two did. And that's that. 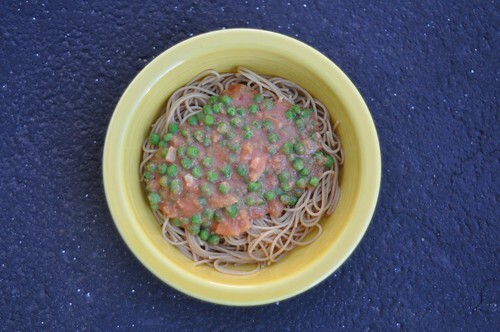 We ate ours first mixed with sweet peas stop some whole wheat spaghetti. And then again tonight, family style, over some farfalle with browned Brussels sprouts on the side. Initially I had planned to freeze the sauce and eventually make some sort of fun lasagne with it. Who knows. Might be worth another go this weekend. It's tasty, but has extra protein and far less fat. Today on Writing Chapter Three, I wrote about why I should never say never when it comes to anything that Ada does or doesn't do. 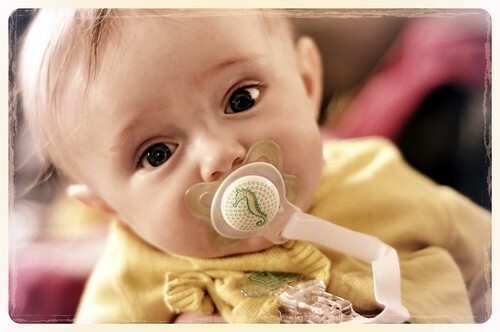 I thought I was a relatively chill mom, but I definitely have a long way to go.